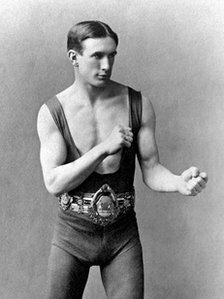 Basham was born in Newport in 1890 and took up boxing in professionally in 1909. A slim-framed man, he was said to have lightning punching power, and became a local and national figure in the boxing world. He first took the British welterweight title in 1914 a few months after the outbreak of World War I. He had joined the Army in 1912 and as a Royal Welch Fusilier was stationed at the Barracks in Hightown, Wrexham, with many of his fights taking place in the town or in nearby Liverpool. Whilst the war interfered with his boxing career, he still managed to defend his title in 1915 and 1916, meaning he was awarded the Lonsdale belt outright. During the war Basham was a member of an elite corps of boxers known as the Famous Six who worked as army physical training instructors. The group included Cardiff fighter "Peerless" Jim Driscoll, a British and Commonwealth featherweight champion. His career took a nasty turn when an opponent, Harry Price, died in the ring and he faced manslaughter charges. He received a lot of public support, but still had to stand trial. Fortunately for him, the magistrate ruled that the fight had been conducted along sporting lines and Basham was acquitted. When the war finished, the boxer resumed his fighting full-time and in 1921 took the British and European middleweight champion titles in a single fight. Basham held the Middleweight titles for less than five months, losing both to his arch-rival "Kid" Lewis when the two met in October 1921. Again Basham was unable to last the distance, being stopped by technical knockout in the twelfth. Basham never challenged for a title again and he ended his career with a series of loses, being knocked-out by World Champion Mike McTigue and a points loss to fellow Welshman Jerry Shea. Basham came out of retirement in 1929 to face "Kid" Lewis, but for the fourth time he was stopped within the distance. Basham reportedly suffered from "cauliflower ear," or thickening and enlargement of his left ear, in his retirement due to trauma from boxing.